What’s A Paper Making Machine? 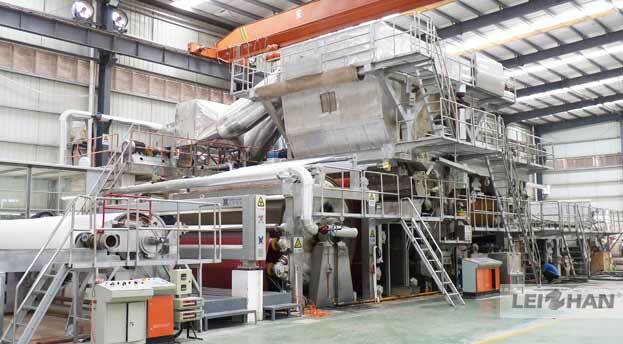 The paper making machine is a complete set of equipment for making the pulp to form the webs, including the headbox, the net, the press, the drying, the calender, the reel, and the main parts of the drive and the steam, water, vacuum , lubrication, heat recovery and other auxiliary systems. The wet paper web is the core of the paper machine, so the paper machine can be divided into fourdrinier paper making machine, folder paper machine and rotary paper machine according to the structure of the network. The lubrication points of the paper machine are, in principle, closed. Each bearing in the wet section of the paper making machine has a closed bearing housing to prevent water intrusion and grease spill to cause cross contamination. The dry section of the paper making machine uses the central lubrication station to lubricate and heat the bearings through conveying lubricating oil by pressure due to the high temperatures when running. The lubricating parts of the paper making machine include transmission gearbox, worm gearbox, general sliding bearing, rolling bearing, exhaust fan, wet section rolling bearing, wire rope and center lubrication station (dry section lubrication). The ever involved oil and grease include hydraulic oil, total loss system oil, calcium grease, sodium grease, graphite calcium and other types.